I’ll Take Your Word For It”. I’m entering a Spring Tag into Frilly and Funkie second challenge. Stamps are from Hero Arts, TAC and Amuse Studios. The Tree Branch Die is from Tim Holtz Alterations. Thanks for stopping in today, have a great week-end. Very frilly, indeed! Pretty tag! Gorgeous Vada, If this doesn't say spring nothing would! Stunning in those pastels and always Loved the image. 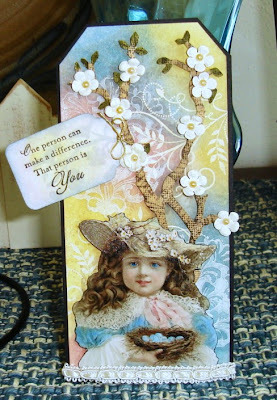 gorgeous tag, sweet vintage goodness, luv it! Vada, this is a Wow factor tag! The image is adorable, but oh how I love what you did with that branch! Stunning tag! Wonderful to have you join in the fun at Frilly and Funkie! Have a fabulous weekend! Hugs! I agree with Lynn - this is a super spring tag! Love the fab background, the tiny blossoms and the sweet little girl image. So glad you could join in at Frilly & Funkie this week! Beautiful, that background is wonderful!! This is just totally gorgeous! Your background is beautiful - both the design and the colors and that darling vintage image has always been a favorite of mine! Just a super beautiful piece of work! So glad you joined in the fun at Frilly and Funkie this fortnight. Hope you will be a regular with us!